We are continuing to improve the CleanCut Convertible – our fastest growing product. Now, with your CleanCut Convertible kit you will receive two sets of Knob Caps. One set of caps can be placed over the knobs, while the other set can be placed in the Convertible frame when the insert is not in place. They help create a sleek and even surface. 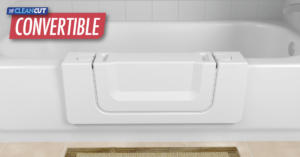 Now you can achieve accessibility without sacrificing the budget, the appearance, or the future value of the tub with the Convertible!